Did you know that even some professional runners don’t necessarily pay much for their running shoes, opting for more affordable yet still effective models? According to a study, published in the British Journal of Sports Medicine in 2007, “low- and medium-cost running shoes in each of the three brands tested provided the same (if not better) cushioning of plantar pressure as high-cost running shoes”. Moreover, the research done by our team revealed that many budget-friendly running sneakers today use technologies found in more expensive models too. So, evidently, good running shoes are not always the ones harming your credit score. Well, what has our team done this time? The challenge was to find 11 best cheap running shoes (sub-$100), which meet the athletes’ requirements in terms of comfort, security, and cushioning. The list is hand-picked and you can already feast your eyes (and bank account!) on the following collection of the best budget running shoes. The Nike Flex 2017 RN Men’s Running Shoe is an awesome heir of the Nike Flex 2016 RN. Designed to be lightweight and adjust to the natural foot movement, it’s a great option for neutral pronators and underpronators. This affordable running sneaker from Nike is also rather versatile and able to cope with roads and asphalt. Upper is made of breathable engineered mesh (looks like a woven cloth), which is flexible enough to let your feet move naturally without any discomfort. Thin overlays help to keep foot stable in place, and the Dynamic Fit technology utilizes Flywire technology to promote an adaptive and supportive fit. Nike Flywire technology consists of strategically placed “cables”, usually used for minimalist models. On the inside, you’ll find a breathable fabric lining that improves the moisture management abilities of the shoe. Lightly padded tongue and collar prevent any rubbing or irritation, and a minimal molded textile footbed adds some extra comfy cushioning from the inside. Dual-density Phylon foam midsole features two planes of cushioning to promote a smooth ride and to keep the experience maximally comfortable. This foam accommodates the entire length of the shoe, so the cushioning is equally spread from heel to toes. Another great feature of the Phylon technology is its lightweight nature. The outsole of the Nike Flex 2017 RN has a tri-star design, which enhances the flexibility of the runner. For the sake of durability, the sneaker has rubber segments, strategically placed in the forefoot and heel areas to make the shoe more durable. Versatility: good for running, gym workouts, and casual walks. Natural feet movement thanks to flexible upper and midsole. Rounded heel for a natural heel strike. Durability issues with the upper unit and the outsole. The shoe runs a bit narrow. Wanna a pair of affordable no-frills neutral running shoes? Asics Gel-Contend 4 is exactly what you’re looking for. Meant for short distances and gym cardio training, these low mileage trainers will be your best deal. This running shoe is one of the most reliable and sturdy options in the budget sports footwear category. The upper of the Asics Contend 4 gets an upgrade compared with its previous version – now it’s much softer and conforms better to the foot, and the bulky plastic overlays are now removed for a more sophisticated appeal. Also, the 4th edition features substantial overlays in the heel and the midfoot areas, which do an excellent job as the stabilizers. Another good thing about the upper is that it puts together mesh and synthetic fabrics so that the runner is lightweight and breathable, too. Soft breathable lining, properly padded tongue and collar, and a removable footbed make the interior of the shoe. This sockliner is cushioned enough, however, you can always replace it with your favorite orthotic if you need. The midsole is made of famous EVA foam for cushioning and durability. The ASICS Rearfoot GEL Cushioning System in the heel provides a lower shock when the heel impacts on the ground. AHAR rubber in the areas that are mostly to suffer from wear and tear and a softer blown rubber in the forefoot are a perfect combo. Moreover, this running shoe has a famous Guidance Line, which makes the ride much smoother. Overlays in the heel and the midfoot for keeping the foot in place. Attractive external design with multiple color options. Versatility: good for running as well as for gym workouts. Not as supportive as the previous versions of the shoe. The shoe may fit a bit loose. 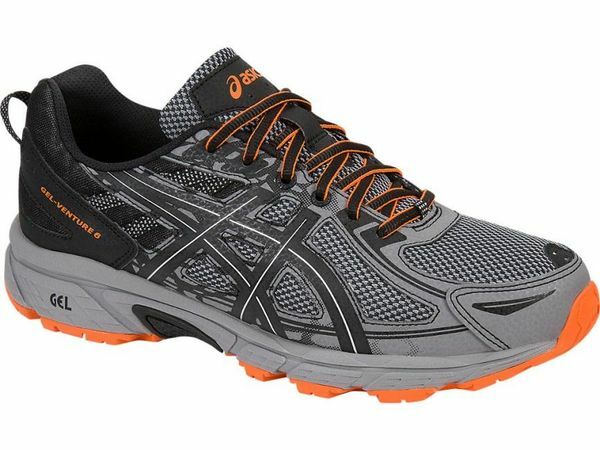 The Asics Gel Venture 6 is a typical representative of the best-value-for-affordable-price type. They’re exclusively versatile and feature a very high level of support so that even people with various feet issues like plantar fasciitis or flat feet can wear them without any risk of injury. An awesome mesh upper design is the first thing that attracts lots of runners – it’s streamlined, smooth, and stylish. It keeps the feet securely locked, allowing it to breathe at the same time. Traditional lace-up closure lets you adjust the runner as you like. The Asics Gel Venture 6 also features a removable insole for more comfortability, a plush tongue, and a soft collar for added comfort. The breathable fabric lining across the shoe upper provides a healthy odor-free environment inside the shoe. The traditional Rearfoot Gel cushioning system is used for maximum shock absorption and a smooth heel-to-transition. During a standard run, the foot encounters vertical impact forces 3 times an athlete’s body weight during the heel strike – this cushioning system in the heel attenuates the shock from this; it stabilizes the foot during the first phase of the Impact Guidance System. The outsole is made specifically for trail running and has innovative reversed lugs. They improve the performance by means of enhancing the grip on a variety of surfaces. Created for short runs and gym workouts, long-distance road running and interval training, the Nike Free RN 2018 is one of our affordable favorites. These sneakers will teach you how to fly – to be the first without any discomfort or injuries and enjoy a super comfortable barefoot-like feel. The seamless circular mesh upper of the Nike Free RN 2018 is more intricate and more tightly knit than in the previous versions. It provides more breathability too. The construction just wraps the foot like a sock, as the tongue is integrated, and the lacing system involves Flywire cables, which are meant for tightening or loosening the whole upper’s fabrics according to your preference. The greatest feature of the Nike Free RN 2018 on the inside is the Ortholite sock liner that mimics the curvature of the foot. This footbed is very popular in more expensive Nike’s models, so don’t miss the chance to get it so cheap. The Nike Free RN 2018 has a low-profile cushion, which is very lightweight but doesn’t sacrifice the responsiveness of the shoe. It mimics the natural foot movement through its innovative pattern – this provides a natural barefoot-like feel. The auxetic tri-star pattern on the outsole allows it to expand in size as the foot moves, increasing the flexibility of the platform. AHAR rubber onlays are strategically placed in the high wear areas – the toe and the heel – for decent traction and steady pace. Available in a great variety of colorways and designs. Secure fit without constraining the foot. Flywire technology for more support. Rounded heel for a smoother heel-to-toe transition. Knit-in ventilation holes for breathability. Textured toe and heel areas of the outsole for traction. Smooth laces may come undone. Lack of room in the toe box. The break-in period is required for achieving maximum flexibility. 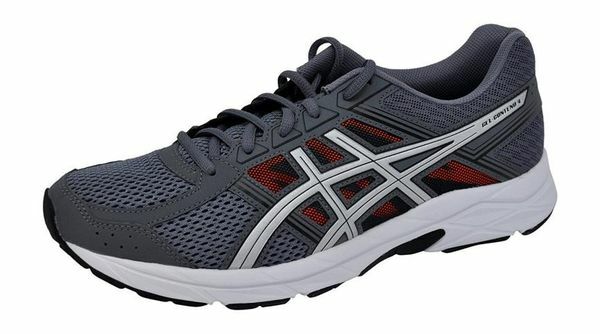 The Asics GT 1000 6 is a real catch for the athletes who look for the best value at a low price. It’s incredible how this stability shoe combines comfort, proper energy return, durability, quality old-school technologies, and the bright design. Comparing with its previous version, the upper’s mesh design is updated to improve breathability and provide a healthier, odor-free interior environment for the runner. Engineered mesh upper is supported with synthetic overlays. A traditional lace-up closure keeps the foot in place, preventing from wobbling while inside the shoe. The full-length breathable fabric lining creates a great in-shoe feel without rubbing or irritation. And the ComforDry sockliner provides cushioning performance and moisture wicking for a cooler, dryer, healthier environment. The midsole of the ASICS GT 1000 6 is stuffed with multiple shoe technologies even more than some expensive models. First of all, it’s SpEVA foam that improves bounce back characteristics and decreases midsole breakdown. Also, the sneaker features the Guidance Trusstic System Technology, which integrates with the Guidance Line construction for ideal gait efficiency and midfoot structural integrity. GEL Cushioning in the rearfoot allows for smooth transitions through the gait cycle. Strategically placed in the most high-wear areas of the outsole, the AHAR Plus rubber is 50% more durable than standard ASICS High Abrasion Rubber. This material is flexible so that the shoe can bend with every foot’s movement. Lighter than the earlier versions. High-quality materials invest in durability. The right combination of comfortable cushioning and high energy return. The Duramo 8 from Adidas is an affordable road running shoe, designed for neutral runners who strive for comfort and performance. The model has stood the test of time and can be worn as a casual running shoe, cross-training shoe, and an everyday sneaker. So, what can the Adidas Duramo 8 offer to you except its budget-friendly price? This typical Adidas upper brings together soft mesh, fused layers, and a plastic TPU caging. It’s really breathable yet supportive and secure. There’s a textile vamp on the tip of the shoe for giving the runner extra support and shape. The upper of the Adidas Duramo 8 also has a streamlined seamless construction – a cool idea for an irritation-free barefoot-like running experience. The removable Ortholite sockliner’s advanced proprietary polyurethane formula with recycled rubber content delivers a combination of benefits unmatched by any other insole manufacturer. Firstly, it gives extra long-term cushioning from the inside. Secondly, it is 95% to 100% breathable that allows air to circulate in and around the insole, keeping the foot cooler inside the shoe. Finally, this insole is very lightweight and machine washable – just throw them in and they’ll come out like new every time while maintaining all of their performance benefits after washing. Also, there’s a soft textile lining on the inside, which allows for proper air circulation and a great in-shoe feel. The contemporary look of the Adidas Duramo 8 was achieved thanks to the complete redesigning of the midsole, in comparison with the previous versions. It’s made of the Cloudfoam material, which is an EVA compound, developed by Adidas for the optimal level of cushioning and responsiveness during the longest races. Non-marking AdiWear rubber outsole is abrasion-resistant, it protects the bottom of the shoe from wear and tear, increasing the durability of the shoe. Versatile & fit for different activities and exercises. Eye-catching design and a good number of colorways to choose from. The removable insole that provides additional cushioning and an anti-microbial function. May fit a bit narrow in the midfoot area. Looking for a pair of lightweight shoes which offer incredible performance and have a cool aesthetic for your daily miles? 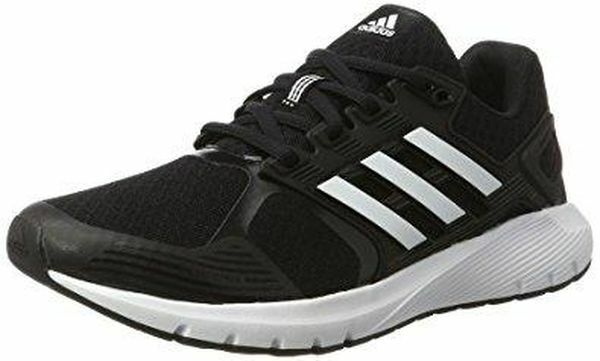 Consider Adidas Energy Cloud V. This affordable shoe is able to give women a super plush ride, support, stability, and breathability for roads and gym running workouts. The Air Mesh material, used in the upper, brings a breathable running experience, as the countless holes in its layout ensure air circulation around the foot. The seamless construction keeps the foot comfy without any skin irritation. All this textile structure is reinforced with a synthetic cage in the midfoot and with a molded cup in the heel area for a locked-down feel. It’s pretty clear from the title of this model that the midsole is made of the Cloudfoam – the material, developed by Adidas on the basis of classic EVA foam. This is a cloud of energy, a plush cush, always ready to spot you. This foam compound does its work great so that you can even consider not having a sockliner at all. The adiWEAR technology in the outsole of the Adidas Energy Cloud V is the key to a combination of traction and flexibility – it is an extremely durable, non-marking rubber used primarily for high-abrasion areas of the outsole – also gives durability and high resistance to abrasion. Good for daily use, long-distance runs, and high-intensity interval training. Stylish design with different colorways. Soft & flexible upper doesn’t cause rubbing. Excellent support for endurance running. Cloudfoam cushioning for instep comfort. AdiWear Technology for flexibility and traction. Fits a little tight in the midfoot area. Nike Revolution 3 is a minimalist running shoe under $100 with all its benefits: lightweight, breathable, compact yet efficient. This model is really the best value for money in many respects. Affordable, good for casual running, appropriate for people with wide foot… these sneakers from Nike deserve your attention for sure! The Nike Revolution 3 features a mixture of stylish mesh upper with synthetic overlays for breathability and comfort. Small perforations in the forefoot and bigger ones in the rearfoot allow a good amount of air to enter and keep the user’s foot dry and cool while running. Standard lace-up closure maintains the snug fit and padded tongue and collar softly keep the runner’s foot in its proper position. The Soft Foam Midsole guarantees the comfortability underfoot, maintaining a plush yet responsive experience. And the Molded Foam insole provides extra cushioning and comfort to the wearer, thereby enabling safe and springy steps. Excellent traction, enhanced flexibility, and maximum durability – all this is about the Nike Revolution 3’s outsole. The rubber material gives good traction on dry and wet surfaces, and the forefoot grooves enhance shoe’s flexibility and enable the sneaker to adjust the individual foot shape. Roomy toe-box – good for runners with wide feet. Breathable mesh upper for moisture management. Why Saucony Cohesion 11 is good shoes for female runners? Because they were created to adjust to women’s feet and withstand the most exhausting long-distance races. This awesome runner covers all the bases: it has a solid and well-fitting upper, durable outsole, and the cushioned ride. And such a low price makes the Saucony Cohesion 11 one of the best picks for runners who equally care about their feet and their wallet. The upper of the shoe is made of a breathable mesh, which guarantees a cool and dry in-shoe experience. There are several synthetic overlays stitched onto the mesh, they reinforce the silhouette giving a snug and secure fit. A traditional lace-up closure allows for secure and adjustable fit. The Saucony Cohesion 11 stands on a sturdy platform, made of full-length foam that provides cushioning to the foot. A memory foam REACT2U footbed gives contoured support to the arch and the curves of the forefoot. Another cool midsole feature is the Heel Grid System, which involves a unit that has a crisscross pattern – it steadies the back of the foot and keeps it in place. The outsole of the Saucony Cohesion 11 is designed to last long: the rubber compound keeps midsole from wear and tear while also delivering surface traction. Flex grooves at the same time allow for maximum flexibility of the shoe. The REACT2U footbed contours the shape of the foot. Adequately responsive in all terrain Grid Cushioning. Rubber outsole provides a better contact with a surface while giving flexibility and traction. The toe box is a bit tight. The color schemes are not as vibrant as its predecessors. The Brooks Ravenna 8 keeps carrying the same underfoot comfort and feel from generation to generation. The 8th edition of the model comes with minimal changes and one of the minor updates can be seen on the upper – now it’s made of a new air mesh material with altered overlays for the same amount of breathability and support. The Brooks Ravenna 8 is a reliable road running stability shoe for women with low to medium arches. A smooth, seamless design is a significant feature of the Brooks Ravenna8 for a comfortable running experience. The upper provides breathable foot coverage for keeping the foot dry and odor-free. The modified adjustable saddle that pulls from the heel functions as a securing element in the midfoot area. The Ravenna 8 stands on the BioMoGo DNA midsole, which delivers reliable underfoot protection and responsive cushioning. Brooks DNA is an innovative and uniquely adaptive cushioning system. By adapting to your specific weight, pace, gait and running surface, DNA offers customized cushioning and adds a spring to your step. It works great with the Diagonal Rollbar that aids the foot to move, giving necessary support. The Progressive Diagonal Rollbar is definitely a value added feature that benefits overpronators. If you usually experience discomfort or pain in your inner ankles after a run, think over the Ravenna 8 from Brooks. The completely redesigned outsole unit now is made of a new rubber configuration that delivers an enhanced traction. The omega flex grooves are also modified for improved flexibility. Roomy toe box for natural toe splay. Under Armour Charged Bandit 3 is designed for runners who need a balance of flexibility and cushioning. Bright, unique, reliable, and secure – that’s all about these stylish affordable sneakers. Made from lightweight and breathable materials, the Bandit 3 offers maximum performance no matter the distance. Seamless upper of the Under Armour Charged Bandit 3 is made of breathable and lightweight circular knit material. Besides comfy in-shoe feel, it also gives support that is able to adjust to your foot while running. The toe box is rather snug but stretchy, it properly secures the toes from injuries. And the EVA tongue has a unique construction – it’s connected to the upper so that it stays put. The midsole of the UA Charged Bandit 3 consists of the Charged Cushioning, made from a two-piece compression-molded foam – great cushioning and impact protection for long-distance efforts or up-tempo runs. The outsole of the UA Charged Bandit 3 provides traction that is suitable for runs on dry concrete and on treadmills. Solid rubber compound covers high impact zones for greater durability. And the anatomically placed flex grooves offer proper flexibility in key areas. Lightweight and extremely breathable upper material. Responsive Gel rearfoot and forefoot cushioning. The arch support could be better. Not enough traction on wet trails. The toe box is not wide enough. How to find a good cheap running shoe? If you’re looking for a good deal, first of all, make sure that you’re doing shopping at the right time: the best months for buying sports footwear are April and January. Don’t make impulse purchases – surf the net first and shop around, make sure that you’ve picked the best value for the lowest price. Also, consider last year’s models – you can find them in the sale and clearance sections, however, they’re no worse than up-to-date runners. Is the brand name important? Well… it depends! On one hand, such famous brands like Nike, Adidas, Puma are a guarantee of the high shoe quality, however, on the other hand, there do exist lots of less-known companies, which don’t have the NAME but do have the high quality. Brand shoes are always a bit more pricey, so if you’re looking for specific features, go under $100 without any fears. How often should I buy new running shoes? This also depends on how often you use your running shoes and how exhausting your workouts are. For example, if you use them for long-distance running, they should be replaced between 300-400 miles; if you do gym training, make sure you find the replacement in 6 months. You don’t have to throw away the sneakers in 6 month, but after this period the cushioning is not able to cope with impacts, so you can wear them for casual walks only. Can I wear running shoes for other purposes? Yes, of course! Running shoes are probably the most versatile footwear – they’re not bulky and stylish enough for everyday wear, they can easily cope with a cardio workout and CrossFit training. However, don’t use them for weight lifting – you’re risking to get injured or get some chronic feet, knee, or back problems. Summing up, it’s obvious, that it is possible to find budget-friendly and high-quality running shoes not only of unknown brands, but also of such sports footwear titans like Nike, Adidas, Asics, Brooks. Yes, it is a challenge to go under $100 in 2018 but the result definitely worth the effort. If the price is an issue for you, consider ASICS GT 1000 6, Brooks Ravenna 8, Adidas Energy Cloud V or any other model from our top-11 list as a great alternative to overpriced running sneakers. You choose if to overpay for the same amount of support, comfort, and performance or not.